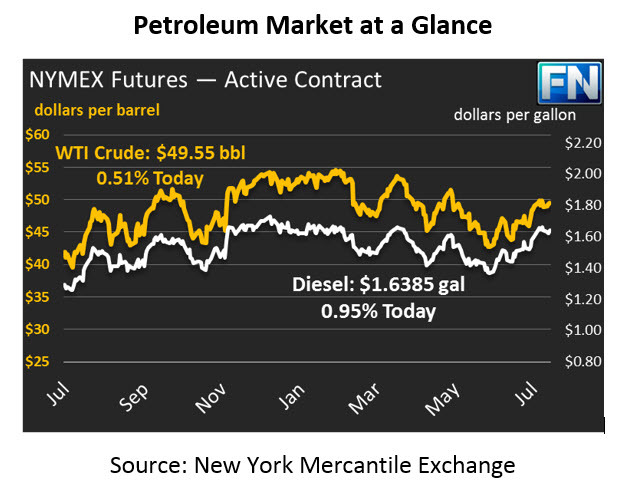 Crude prices have remained fairly unchanged at $49.55, up just 38 cents (.77%) from yesterday’s close. Even after the API’s report was released, showing 7.8MM bbls draw, crude remained flat throughout the day suggesting that markets are more cautious to make decisions based on the API report. Like crude, refined products also experience very little change since yesterday’s close. Diesel prices are at $1.6385, up less than a penny by .93 cents (.57%). Gasoline is at $1.6196, down by only .13 cents (.08%) from closing. After the conclusion of OPEC’s two day meeting in Abu Dhabi, OPEC states the typical comment that they expect greater compliance to the deal. They also noted that Iraq, UAE and Kazakhstan, who have shown relatively low compliance thus far, are fully supportive of the agreement and are committed to the cuts. President Trump delivered a speech from his country club yesterday addressing North Korea’s nuclear advancements. President Trump warned North Korea that they best not make threats against the United States or they will be met with “fire and fury” unlike the world has never seen. The President’s “fire and fury” speech increased the value of gold and the dollar overnight; however the dollar is now trading slightly lower. The EIA released its monthly Short-Term Energy Outlook report highlighting that it expects a rise in crude production to 9.9mmbpd in 2018. Read the full EIA report below. The EIA weekly inventory report will be released later this morning.